Flaster Greenberg's real estate attorneys represent a variety of industry participants in virtually all aspects of real estate, including development, construction, land use, liquor license matters, taxation and financing - from acquisition to development approvals, to project leasing and/or sale, and/or real estate joint ventures to condemnation, redevelopment and environmental litigation. We work with individuals and businesses on matters ranging from complex real estate joint ventures and alternative energy initiatives to general, land use and environmental litigation. Because we believe that your interests are best served by those who understand the totality of your business, we provide comprehensive legal counsel and strategic planning. We represent a broad range of clients, including individuals and entities buying, selling and operating investment properties, and local and national developers building individual and multifamily market rate and low- and moderate-income level residential units, shopping centers and other retail development, automotive and truck dealerships and office and industrial complexes. We also represent and are active in construction industry trade associations. In real estate as in other practice areas, our attorneys take a practical, creative and cohesive approach to achieving clients' objectives. Our Real Estate and Land Use Practice Group attorneys believe that our clients are best represented when their attorneys can understand and deal with an integrated business, not just narrow legal technicalities. 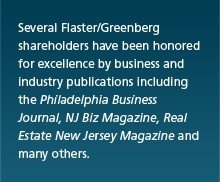 Eleven Flaster/Greenberg Attorneys Honored by Thomson Reuters as 2011 New Jersey “Super Lawyers" and “Rising Stars"
Gone, but best not forgotten: Have a new home? Its seller can provide useful tips. When Does NFA Really Mean NFA?